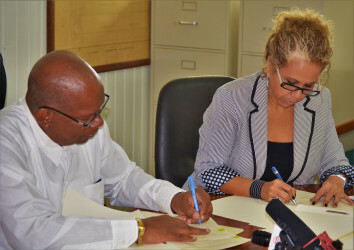 Minister of Finance Winston Jordan yesterday signed a pact which will see IDB-funded surveys in key areas such unemployment statistics, perceptions on crime and living conditions. A release from the Ministry of Finance said that Jordan signed three non-reimbursable technical cooperation agreements valued at US$1.3million ($268, 450,000) with the Inter-American Development Bank (IDB) for the design and implementation of three surveys. The Crime and Victimisation Survey, Labour Force Survey and Household Survey on Living Conditions will help state agencies to bolster their capacity to gather and analyse social and economic data as well as monitor and evaluate the impact of government policies and programmes. The release said that these are the first surveys of their kind in more than a decade. During the signing, the release reported Jordan as saying that he was heartened by the agreements as very early in the life of the Government, a premium was placed on statistical data so that government policies and plans could be carried out in a structured and more informed manner. This, he said, will ensure that resources are optimally utilised. The grants will cover expenses related to training the staff of the Bureau of Statistics and the execution of the surveys. Under the household survey of living conditions, information will be accumulated on income, health, employment, educational attainment and housing conditions. This data will allow for the computation of poverty rates and income inequality. Information on unemployment and employment participation will be garnered under the labour force survey which will be conducted on a quarterly basis. The crime and victimisation survey will look at perceptions on crime, violence, and domestic abuse as well as the underlying issues of pervasiveness, underreporting, socio-economic profiles, and geographic patterns. Sophie Makonnen, IDB Country Representative said that the signing is the first of the 2016 support Guyana will receive from the Bank. She pointed out that data on living conditions and unemployment are from 2006 and 2007 respectively. The surveys will address gaps and weaknesses that emerged during the past decade and will be executed within the next four years.